Capture the Faire in a photograph – and be part of our special calendar competition! 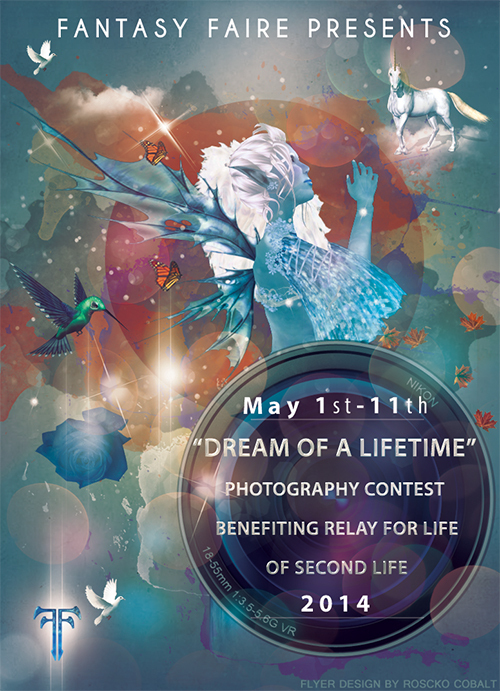 We are looking for the photographs that best capture the spirit of each of the eleven sims – and the winners will be included in a calendar (with credits for the photographers) that will be created in real life using Cafe Presse and sold to raise money for Relay for Life. So this year, people really will be able to take the Faire home with them – and share it with their friends and family too! But … eleven sims … eleven months. What of the twelfth? That one will be the photograph that – in the opinions of the judges – best encapsulates the spirit of the Faire. Not only will it be the image for the twelfth month – it will also appear on the cover of the calendar. Twelve photo entries will be allowed per person. 1St Prize winner photo will be on the cover of the calendar. How do we set our viewer to produce the proper size and “dpi” (?). I would guess Photo Shop wizards will win , but some if us amateurs with just a Brownie box camera would like to enter also . Are you using Firestorm? I found that I could set my screen size under the Advanced menu, then take a High Res snapshot (again on the advanced menu), and adjust the dpi. The quality remained excellent. Tried to enter this photo https://www.flickr.com/photos/xannaziskey/13955417939/in/photostream/ to contest. Got a “content not allowed” reply. Why? It’s rated “safe,” I’ve put the sim name in the description. Is there a problem? That seems odd – I’ll look into it.